"3LA1, V-1128" by Timothy K. Perttula and Robert Z. Selden Jr. CONTEXT INFORMATION: From a plowed out grave, 1934, along with V-1122 through V-1136 and V-159 to V-162. DECORATION: The rim is horizontally brushed, with two rows of tool punctations at the rim-body juncture. 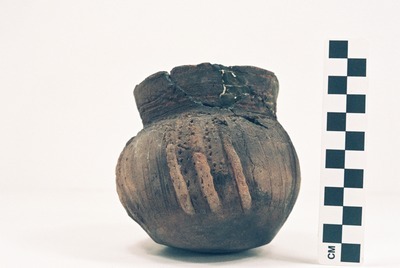 The vessel body has four vertical sets of appliqued fillets, two with three fillets and two with two fillets, that reach nearly to the vessel base. There are a series of vertical incised lines between each set of appliqued fillets.